It is with deep sadness that I report that AMSI’s inaugural Director, Emeritus Professor Garth Gaudry has died in Sydney following a long illness. All at AMSI extend their heartfelt sympathies to his wife Patricia and children Kerry, Rebecca and Peter. Garth played a pivotal role in the formation of AMSI. When the heads of university mathematical sciences departments were told that a bid was being prepared in Victoria for the establishment of a mathematical sciences institute, he immediately saw that this could benefit the wider mathematical community and announced that the UNSW would be a foundation member. Other Australian universities followed and so a national institute was created. Garth subsequently became the Institute’s first director. His long advocacy of the mathematical sciences had begun many years before. From 1986 to 1990 he was the Vice- President and then President of the Australian Mathematical Society. He took a leading role in the creation of the Australian Mathematical Sciences Council (AMSC), an umbrella group for the mathematical sciences on the Board of the Federation of Australian Scientific and Technological Societies (FASTS) and was the first AMSC President. All this served him well as AMSI Director. Dr Brendan Nelson, then Minister for Science and Education, was approached and became a firm supporter of AMSI. Funding was obtained for the first Summer School for honours and post-graduate students. The 11th Summer School will be held in 2013. AMSI continues to take a leading role in advocacy and policy development. In 2003 AMSI was awarded a major grant to establish an International Centre of Excellence for Education in Mathematics (ICE-EM). Garth chose to relinquish the AMSI Director position and became ICE-EM Director. ICE-EM funded many higher education activities and the establishment of a number of Access Grid Rooms that enable, for example, someone in Townsville taking part in lecture given in Perth. It also led to major initiatives in school education. When mathematics teachers were asked what would assist them most they asked for quality textbooks. And so the ICE-EM schools mathematics materials consisting of books and support materials came into being. Garth worked tirelessly to see this project come to fruition until ill health forced his retirement in 2008. 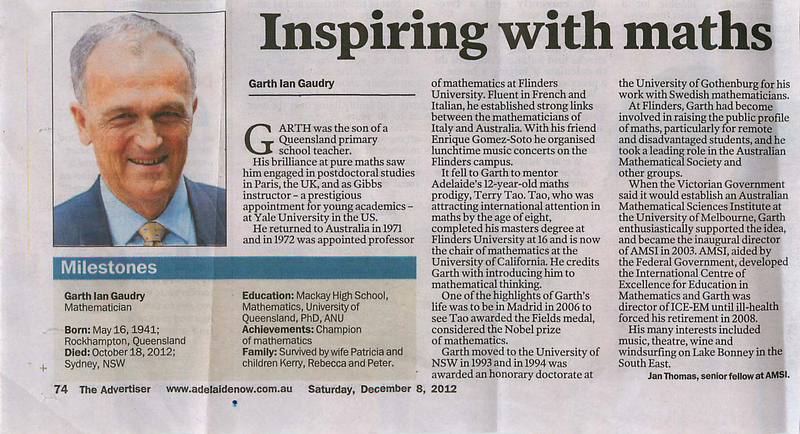 Garth brought a new level of professionalism to the public face of the mathematical sciences. He knew that AMSI and ICE-EM had to have high standards of design, printing and reporting. The high quality of AMSI materials is a tribute to the initial standards he set. AMSI stands as a tribute to his hard work and foresight. The mathematical sciences owe him a great debt.